Lourdes Hospital, a critical care hospital in Binghamton NY, is located in a 100-year floodplain on the banks of the Susquehanna River. Founded in 1920 on donated land, it had grown into a major regional hospital that provided critical services to the community. In 2006, a 500-year flood forced the hospital to shut down and evacuate patients. The flood caused an estimated $20M in damages. The hospital decided to embark on a $70 million, 3-year construction project to modernize the hospital and provide a more streamlined system of obtaining outpatient services. The hospital, which could not be relocated, was approved for flood mitigation funding from FEMA and NY State. Woidt Engineering and Dan Griffiths Engineering teamed to develop a flood study and design a flood protection system for Lourdes Hospital. The project included hydrologic and hydraulic modeling of the Susquehanna River, assessment of floodplain impacts and investigation of flood prevention alternatives. The final design phase included permanent concrete T-walls to the 500-year flood elevation and 11 FloodBreak® passive floodgates. FloodBreak Automatic Floodgates were selected because they provided permanent flood protection that would not require human intervention or power. The flood barriers would also remain hidden beneath the entryways allowing unimpeded access to the hospital by patients, staff and visitors, unless it flooded. 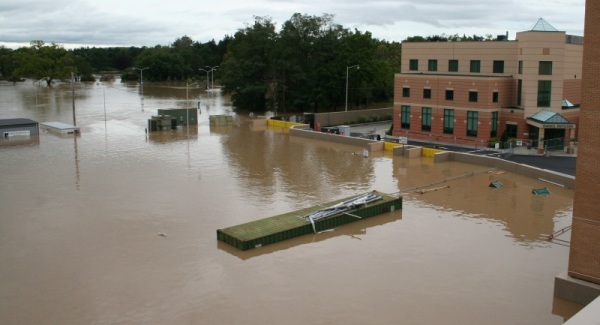 In September 2011, the area was inundated by record-high floodwaters from the remnants of Tropical Storm Lee adding misery to an area already soaked from Tropical Strom Irene 10 days earlier. The Susquehanna River reached 25.71 feet – 11 feet above flood stage – before it began to recede, eclipsing the previous record of 25 feet in 2006. The floodwaters came within 30″ of the top of the floodwall but never breached. This time the hospital remained fully operational, unlike an estimated 2000 area buildings that were damaged by the flood, and continued to serve the community.